You may not yet be familiar with Notion, which was created by a two-year-old startup based in San Francisco. 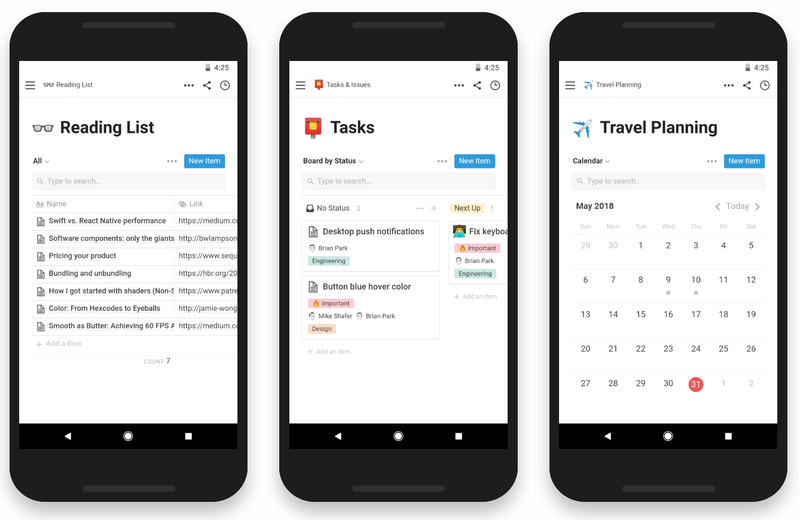 It was initially aimed at businesses that need powerful tools to track tasks and manage projects, but thanks to the introduction of an affordable subscription plan, it has become a terrific service for regular consumers, too. What makes Notion so good is that it handles almost anything. Whether you need to save notes, create a to-do list, draw up design specifications, or draft blog posts, Notion gives you the tools you need. Every time you create a new page, you can choose from a library of templates that are suited to your task. Each of your pages can be linked to any other document, and everything can be organized into collapsible workspaces dedicated to different projects. You can insert images, videos, and all kinds of other content, and everything can be re-organized with a simple drag and drop. It's surprisingly sophisticated, yet easy to learn and use. You really have to try Notion to appreciate just how powerful it is. It's available across macOS, iOS, Windows, and now Android -- and you can get started for free. An individual subscription, which gives you unlimited storage, removes the file upload limit, gives you advanced permissions, and offers priority support, is priced at just $4 a month. That makes Notion more affordable than Evernote, despite competing on features.